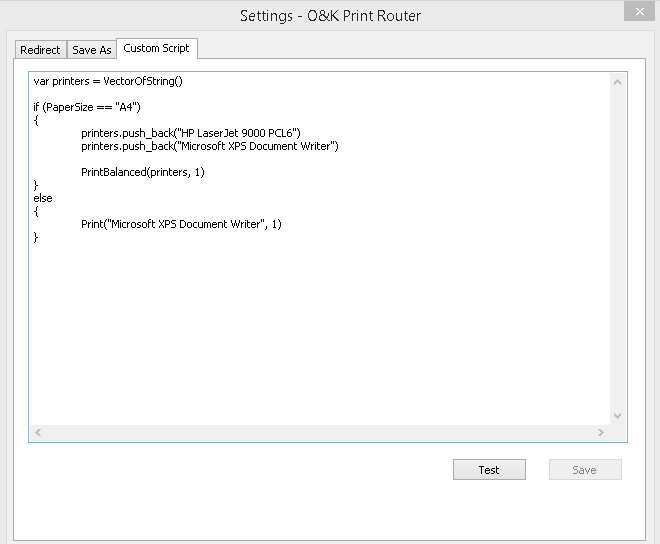 Starting from version 3.00, O&K Print Router supports user scripts for faster printing and balancing load between multiple printers. The scripts are written in Chaiscript. For more details about this programming language, please visit the ChaiScript official website. Print("Printer name", Number_of_Copies) – Print the specified number of copies of the document on one printer. PrintMultiply(Printers_List, Number_of_Copies) – Print the specified number of copies of the document on ALL printers from the list. PrintBalanced(Printers_List, Number_of_Copies) – Print the specified number of copies of the document on THE MOST AVAILABLE printer from the list. DocName – The document’s name. Copies – The number of copies. Color – Color printing mode; 0 – monochrome printing, 1 – color printing. if (PaperSize == "A4") // If paper size is "А4"
else // If paper size is NOT "А4"